Find out how Team USA trains to perform on the pitch on the sport’s biggest stage. Over the course of an average international match, elite soccer players will run anywhere from 6-10 miles, depending on their position. But a great deal of this running is done in rapid bursts of explosive speed. They’re sprinting, tackling and cutting, all while being bodied up – or bitten by – driven, well-conditioned opponents. Body control is paramount for everything, including winning headers at midfield or securing your place in the box. Oh, and don’t forget about the abdominal and leg strength it takes for that defender to boot the ball out of the backfield. As the best players in the world battle through the Brazilian heat for the sport’s most coveted trophy, we should all give pause to the physical preparation that is required of them. U.S. Soccer women’s national team strength and conditioning coach Dawn Scott, an expert in exercise science and sports nutrition who has been training elite athletes for years, gives us an inside look at what Team USA has done to muscle its way into the Round of 16 at the 2014 World Cup. How rigorous are the physical requirements for a World Cup-level athlete? At the World Cup, you have the best players in the world competing so all players need to be at their physical peak to perform in the tournament. Soccer players need a good level of strength, power, endurance, speed and agility. The better each of those are then the better the player will perform and have more impact in games. High levels of strength and endurance will also enable players to reduce the risk of injury, although contact injuries cannot be avoided. 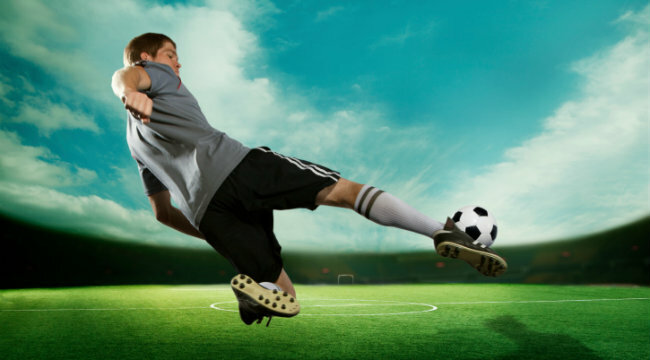 Typically, during a soccer game players cover 10-14 kilometers (6.2-8.7 miles). Soccer is a high-intensity, intermittent sport. However, where players are continually changing pace and direction, as well as jumping, turning, tackling and completing soccer actions, and they all put more stress and physical load on the body than if the players just ran at one pace and in one direction for 90 minutes. Players therefore need to prepare for all of those actions. During this World Cup tournament [in Brazil], in a challenging climate, the demands during games are increased further since the body has an increased external heat load. In this heat, and with high humidity, the sweat just stays on the skin, blocking the sweat pores, and causing the body’s temperature to increase. During some World Cup games, water breaks have been enforced to try to offset the increases in body temperature and limit the effects of dehydration on the body. Who is the best overall athlete on the men’s senior team and what sets him apart from the others? That is a tough one to answer. For soccer players in general, you don’t tend to find a player who is best in all of the physical attributes since physiology and genes make that difficult anyway. So your fastest players may not necessarily have the best endurance, and your players with the greatest endurance aren’t necessarily your fastest players. From watching games in the this World Cup in Brazil, Michael Bradley has been covering the greatest distance for the U.S. and with that you would suggest he has a high/the highest level of endurance but is not as fast, maybe, as players like Arjen Robben (who recently clocked 19.26 mph) or Loic Remy. But then each position has certain physical requirements and players need to have those attributes to perform well in those positions. People marvel at soccer players’ ability to run for so long, but do they ever engage in serious strength work like with squats or deadlifts? high intensity interval type training and some repeated sprint work. During this phase players would also take part in more soccer game play to build up to the start of the competition period, during which games start. During the competition period, players have little chance to develop fitness and that period is more about recovery from games in preparation for optimal performance in the next game. Do you know how many calories a soccer player will burn, on average, during an international-level match? You can estimate calories burned by collecting heart rate data during games or training, however, this is an estimate and for a more accurate measure players should wear complicated masks to collect and analyze expired air samples, which obviously is not practical during competition. We did have our women’s national team players wear HR transmitters during games and, for one player, she burned approximately 2000 calories during the 90 minute game, 600 during extra-time and 150 during the penalty shoot out! So typically players would burn 1500-3000 calories during a 90-minute game depending on body size, intensity of the game, position, and the environment conditions. The majority of this fuel is carbohydrate and it is vital that players replace this following each game, along with protein to aid muscle recovery, to help recover for the next game. What is the focus for elite soccer players in the weight room? During the general preparation phase, players would focus on strength development with higher reps and sets initially for muscle hypertrophy but as they progress they may shift to higher weight with lower sets and reps. Key exercises for such development would include squat, power clean (or some derivative), heavy press and then for soccer functional and assist exercises such as single-leg Romanian deadlift, proprioception work [for body awareness] and core development. I also think that the use of different equipment such as bands, kettlebells, TRX, BOSU, physio balls, medicine balls and battling ropes helps us to vary strength focused sessions, make them more functional and produce stronger and more powerful athletes. Are there types of exercises that soccer players avoid? Which ones and why? I don’t think any athlete needs to necessarily avoid any kind of exercise. For me it is more about making sure the technique is good, since poor technique is why athletes often can pick up injuries or muscle soreness during lifting sessions, especially if athletes are lifting a heavy load with poor form. Other than that, I am not a fan of using machines – except maybe during rehab or for some individuals with restrictions or underlying medical issues – as I feel that machines are not as functional as other exercises and methods of training. Also I prefer to combine some exercises to make them more functional to the athlete.